More than half of the world’s population now resides in cities. Managing human settlement development in the world has thus become one of the most challenging tasks for human beings. With Mainland China emerging as the second largest economy in the world since its economic reform, human settlements are faced with daunting challenges, including imbalance in wealth distribution and urban development. These unprecedented challenges prompt new ways of looking at and managing cities that incorporate traditional and cutting-edge approaches to urban management. 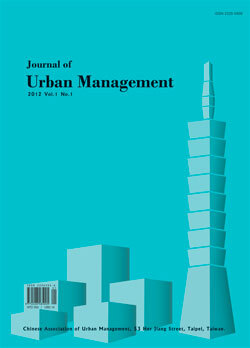 Journal of Urban Management thus provides a forum for academics and practitioners to share their original, creative work as scholarly conversions that cut across traditional disciplines, such as public administration and urban planning. The objective of the Journal is to provide useful insights into how human settlements should be planned, governed, administered, and regulated, with a particular focus on Taiwan and Mainland China.